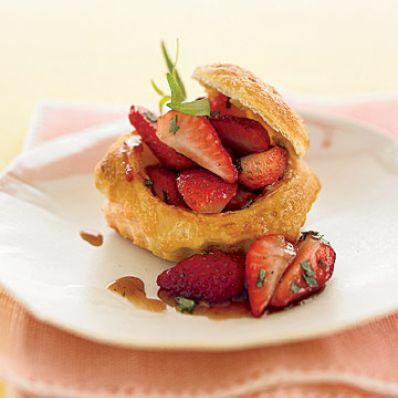 1 of 4 In a bowl, stir strawberries, 2 tablespoons of the sugar, the vinegar and minced tarragon; refrigerate 1 hour. 2 of 4 Heat oven to 400 F. Brush tops of pastry shells with milk; sprinkle with remaining 1 tablespoon sugar. Bake at 400 F for 22 minutes. Remove from oven. Carefully remove tops with a fork; set aside. 3 of 4 Return shells to oven for an additional 2 minutes. Remove from oven and brush inside of shells with strawberry jam. 4 of 4 Spoon 1/2 cup strawberry salad into each shell. Rest top on the side, garnish with fresh tarragon sprigs and serve.